With one of the world’s largest populations, Indonesia offers huge opportunities for foreign investors. As the ‘I’ in the elite group of CIVETS (Colombia, Indonesia, Vietnam, Egypt, Turkey and South Africa) – emerging market economies with reasonably sophisticated financial systems, controlled inflation and soaring, youthful populations – Indonesia figures prominently on investors’ radars. It’s not hard to see why; a nation of 260 million people that is recording GDP growth in excess of 5% a year, and that boasts a large and growing middle-class consumer base, is an attractive proposition – for all the complexities and challenges that the archipelago economy poses. The 1997 Asian financial crisis badly affected Indonesia, both economically and politically, but it has made strong progress since then. Today, it is the largest economy in Southeast Asia and a member of the G20, in which it is the third fastest-growing economy behind only India and China. Under President Joko Widodo (widely known as Jokowi), who has been in office since 2014, the Government has placed structural reform at the center of its strategy. The past year has seen significant developments across a range of fronts. For the first time since the financial crisis, Indonesia’s sovereign bonds are now rated investment grade by all three major international credit ratings agencies. This will make it easier to raise debt. The economy grew at the quickest pace in four years in the last quarter of 2017, with GDP increasing by 5.2%, according to the country’s statistics bureau, thanks to stronger private consumption and government spending. With inflation under control at 3.6% in 2017 and the fiscal deficit low, at 2.5% of GDP, there are hopes of another ratings upgrade this year. Business leaders see scope for yet more expansive growth. “We’ve had a couple of years of 5% average growth, but the Government is working hard to raise levels closer to 7%,” says Nick Holder, CFO at Prudential Indonesia, the local arm of the international insurance firm. Yet the Government faces many challenges. 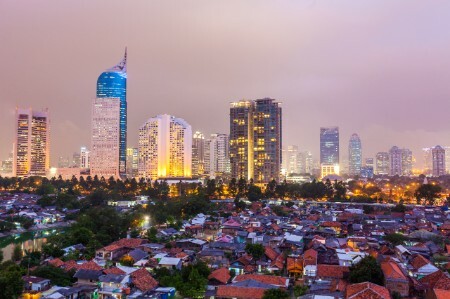 Bank Indonesia (the central bank) recently warned that significant foreign direct investment (FDI) is still needed to boost economic growth, especially to finance massive infrastructure projects. Moreover, the economy remains overly reliant on foreign debt. This reached US$347.3b at the end of November 2017, up 9.1% year on year. This could pose a threat if the rupiah weakens. For large companies, trying to be nimble is the best way forward, but it is like an elephant trying to dance — easier said than done. Meanwhile, corporate governance is not as strong as it could be. Indonesia ranks last out of 11 Asian markets in the Asian Corporate Governance Association’s most recent Corporate Governance Watch survey, issued in 2016; while reforms have been introduced, some commentators have suggested that they are not being implemented speedily enough. Key sectors have been under pressure in an economy that is highly correlated with commodity price trends. Retail is one such sector and is strategically important, given that consumption accounts for more than half of the country’s economic growth. Official data shows household consumption growing at a slower pace compared to previous years (at just under 5% in 2017). As a result, some international retailers have been forced to shut down operations in Indonesia. This ties back to broader drivers shaping the Indonesian retail landscape. “We are witnessing shifts in consumer spending patterns toward leisure, entertainment and education. Because of that, the fast-moving consumer goods (FMCG) segment is under pressure,” says Tevilyan Yudhistira Rusli, CFO at Unilever Indonesia. The global consumer giant has long roots in Indonesia, with a market presence dating back 84 years. Indonesia’s insurance and financial services market is another area that offers substantial growth opportunities. Figures from the Indonesian Life Insurance Association reveal that just 17.7 million Indonesians were insured in the second quarter of 2017. Premiums underwritten represent only 1.3% of the country’s GDP. One of the Government’s big initiatives of recent years has been to create a form of universal health service called Jaminan Kesehatan Nasional (JKN). This helped people to get medical treatment, and JKN now covers 190 million people. According to Holder, it has also helped move healthcare up the agenda in terms of individual decision-making agendas. If anything, this has increased individual demand for private medical insurance. Much of Indonesia’s focus this year will be absorbed by the electoral cycle. Simultaneous elections will take place in 171 regions, including 17 provinces, in June, followed by campaigning for the presidential elections that are set for 2019. However, the Government will also be looking to boost its reform program. The International Monetary Fund delivered an assessment of Indonesia’s economy in February 2018. It urged the Government to adopt a fiscal-structural reform package that mobilizes revenues to finance development spending and supports structural reforms in the product, labor and financial markets. It already has a head start. The Indonesian Government has launched 15 policy packages on structural reforms since 2015 and repealed more than 3,000 regulations that hampered investment. One of Jokowi’s priorities when he became president was to introduce a Tax Amnesty Program, an important instrument to ensure that the Government receives tax revenue it can use to pay for infrastructure projects. Another key focus for the administration has been to deliver on anti-corruption commitments. There is a drive to punish those who are deemed not to be playing by the rules, and more actions are being taken against those found to be guilty of committing acts of corruption. Bill Hayton, an Associate Fellow at think tank Chatham House’s Asia-Pacific program, says: “Clearly, the authorities are trying to reform the economy and simplify things, such as reducing some of the controlled sectors. There are still industries where foreigners can’t invest, but these are diminishing.” By way of example, he points to some investor concerns about a reviving resource nationalism that has affected hydrocarbons and minerals sectors. Unilever’s Yudhistira highlights the liberal nature of the foreign investment regime, allowing 100% foreign ownership. But he cautions that in some sectors – such as FMCG – if you are wholly foreign-owned, you may be restricted from direct access to the market. “If you are in a joint venture with minority local shareholders, you can sell direct to department stores, but if you are 100% foreign-owned, you need to have local distributors to get you into the store,” he explains. Figures correct as of May 2018. With one of the world’s largest populations, Indonesia offers huge opportunities for foreign investors. Now the Government is working hard to address some of the problems that have held this potential powerhouse back.